We’re glad that so many people took advantage of our very first pattern sale last weekend! If you missed out, don’t worry, we have a couple sales and contests planned for the not too distant future…so be sure to stay tuned to the blog every Friday! 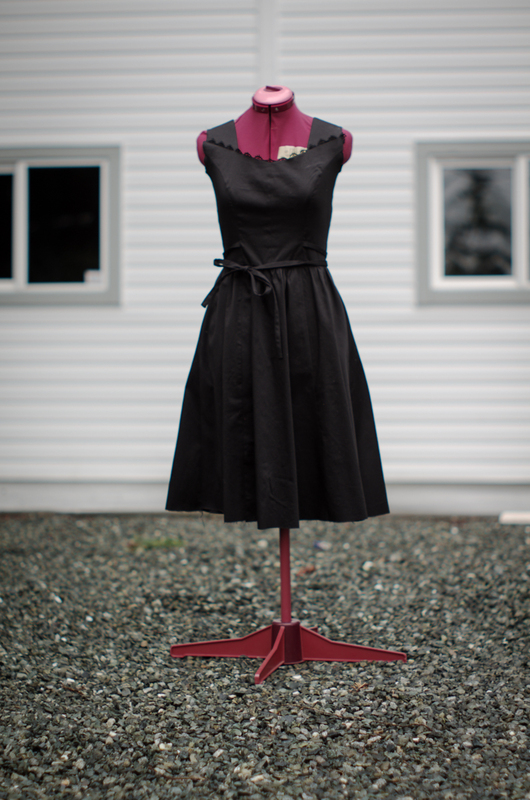 Last weekend’s sew-cation was a delicious break from work sewing. There are pictures coming up displaying a couple of the projects I worked on later on in this post, but first I MUST show you what arrived in the mail two days ago!!! Diagram is from Kiki Creations. Since the top is folded over twice the label is very versatile: It can sandwich the hem of a shirt (the Strathcona Henley for example) with a simple topstitch across the top, it can be stitched along the top and bottom folds to secure it to a neck facing (the Newcastle Cardigan!) or it’s folds can be opened and ironed flat so that it can be sewn into a collar, side seams or a waistband (this method could work for all three patterns!). I can’t wait to start using these in my own creations and I hope everyone will enjoy finding one in their package when they buy one of our upcoming paper patterns! I’ve inserted a lace trim to highlight the interesting neckline. I was watching The Notebook while I sewed the bodice and I felt the look of the dress really suited the feel of the movie (though maybe not in such a severe colour!). 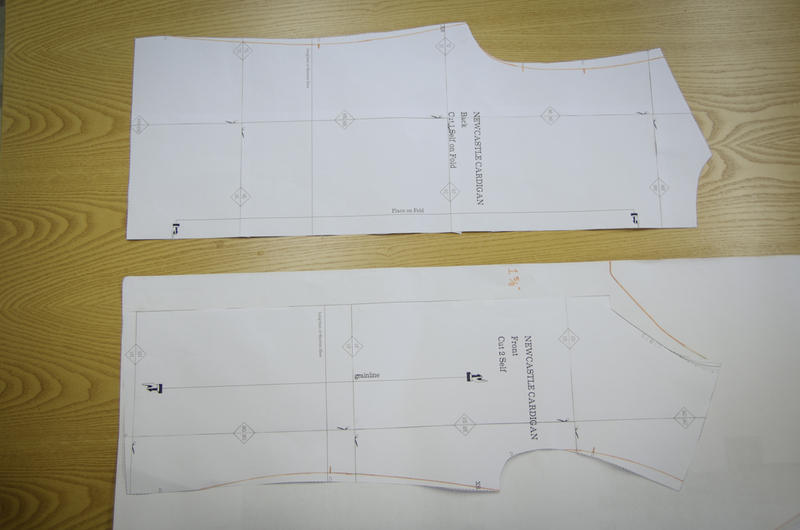 I’ve yet to sew the armholes because this was the area I had the most fitting trouble with my mock up. I’m going to leave them raw until I’ve inserted the zipper, that way I will know exactly how everything is fitting and at that point will likely make them a bit bigger. 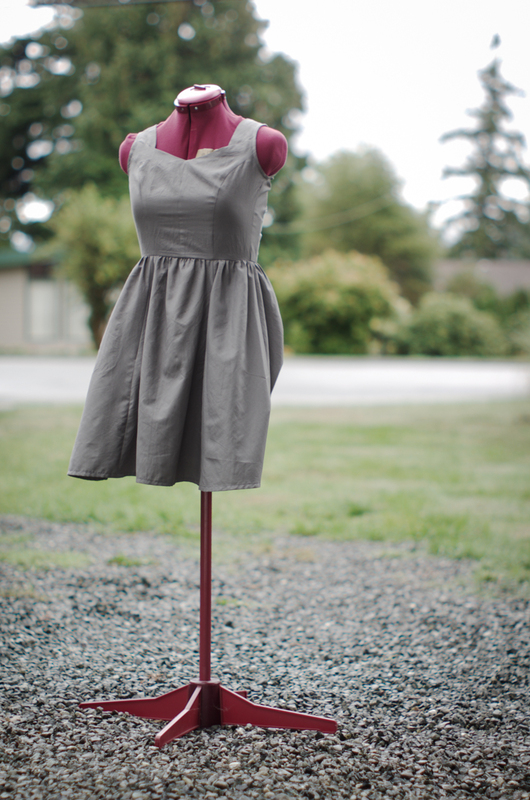 Here is the mock up that I did using a very thin and synthetic (but oh-so-soft) Value Village sheet. 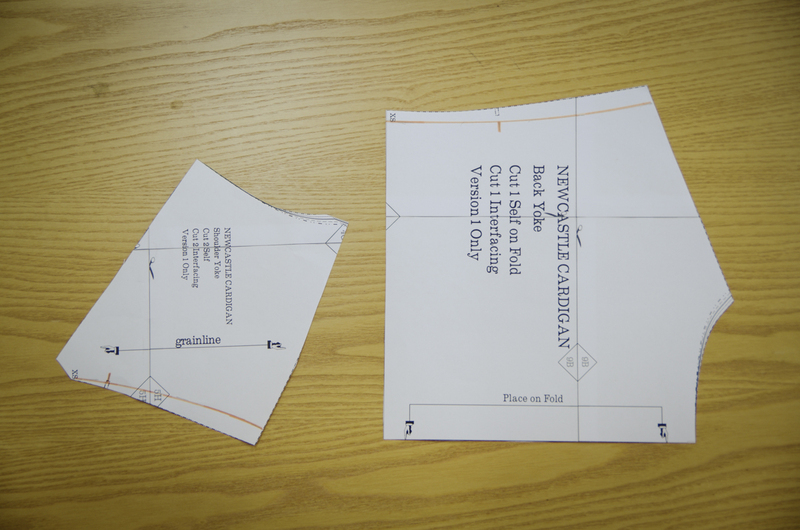 Based on the reviews over at Pattern Review, I mistakenly decided to cut the dress in the smallest size which was actually two sizes smaller than the pattern envelope told me to use. The reviews I read all stated that the amount of ease was enormous, which I believe, but I think I was a little over-zealous and should have cut just one size smaller instead of two as the resulting mock up is skin tight on me (and fits my mannequin terribly!). Hopefully I’ve fixed this sizing problem with the black version of this dress as I really like the comfortable looking fit that Jorth achieved. 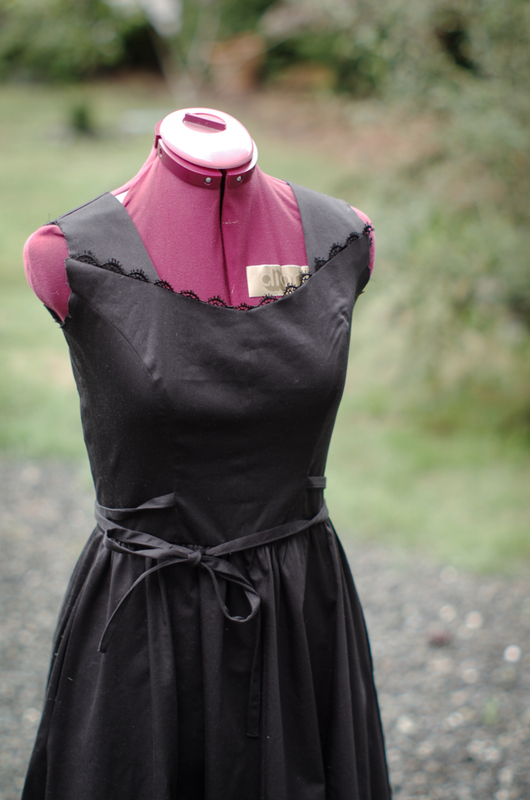 I will post a full review of the pattern and photos of me wearing my black dress when I’ve finished it. In the meantime, Matt and I are getting ready to move (AGAIN) and are looking forward, after a nomadic spring and summer, to settling into our HOME. We’ve found a lovely place in the Comox Valley (British Columbia, Canada) and have great plans to set up a proper Thread Theory studio. I look forward to showing you what we come up with! 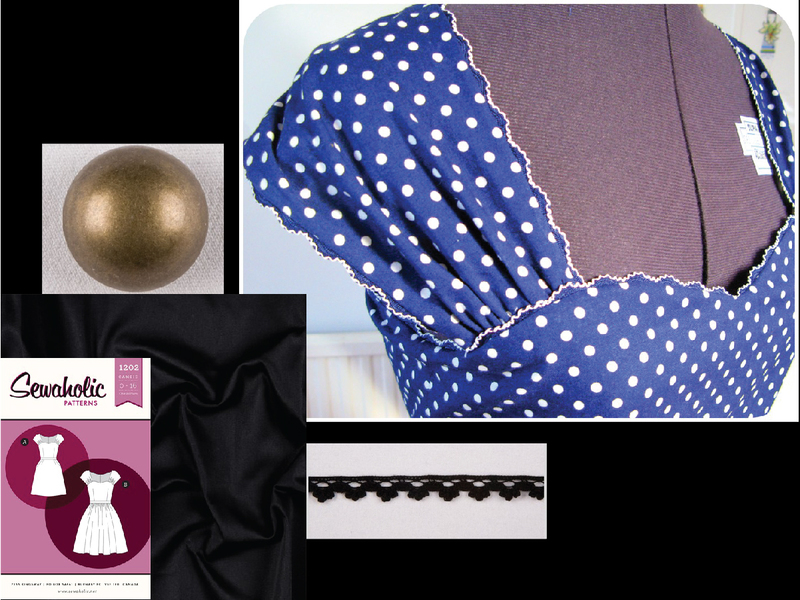 Categories: Friday Posts, Morgan's Sewing Projects | Tags: garment tags, lbd, little black dress, sewcation, simplicity 1803 | Permalink. Morgan’s Newcastle – adapted to create a ‘stolen from the boyfriend’ style sweater! This weekend, in celebration of the pouring rain and occasional thunder outside our studio window, we are having a Newcastle Cardigan Sale so that you can sew yourself or someone else something cozy as Fall approaches! From now until midnight, September 22nd (PST) (while I am on my Sew-cation) you can buy the Newcastle Cardigan PDF sewing pattern at 20% off! Simply enter the code RAIN at check out (using capslock). Happy sewing! Since Selfish Sewing Week is coming up, I sewed something yesterday that will ease me into this weekend’s much anticipated ‘selfish’ sew-cation. This project is both, in essence, completely selfish and decidedly thoughtful…I sewed a Newcastle Cardigan for myself! Its selfish because I used work time to sew something that I will wear and skipped over the list of several cardigans I’ve agreed to make for family members and investors (woops!) to make my version first. It’s thoughtful because I can now wear a ‘stolen from the boyfriend’ style cardigan without actually stealing it…not that I’ve managed to steal Matt’s more than once or twice. Every time I’m chilly and go to grab it, he’s already wearing it! I love my green wool version. It’s my absolute favorite colour and I treated myself to all my favorite features: military-esque brass buttons, huge patch pockets, extra long sleeves, leather details…the works! I kept the fit really slouchy and exaggerated by cutting a size XS (way too big for me!) and then limiting my sizing adjustments to narrowing the shoulders and only slightly exaggerating the curve of the waist. That way, the arms are still really wide and it is too long for me, making it the coziest of cozy sweaters to put over top of bulky layers for fall evening walks and to wear while sewing in my chilly sewing studio. The rest of the adjustments I made were a bit of an experiment to see if I could eliminate the use of facings and also add a zipper. As you can see, the zipper was a dismal failure and was quickly ripped out. I think that a shawl collar, super slouchy fit, and stiff zipper could never co-inhabit the same sweater happily. The zipper sat so stiffly that it pointed out, away from my chest at the top and looked really ridiculous. Instead, I decided to treat my bound seam allowances as a built in facing by interfacing them, folding them over and adding button holes. I added buttons on a slight asymmetrical angle to make the sweater fit slightly smaller in the chest and I kept the bottom of the sweater open to accommodate for my hips as I didn’t add width here (if you wanted to make a buttoned Newcastle for a female without many alterations to the pattern you would have to add width to the pattern pieces at the hips while likely taking away width at the waist to better fit the female form). 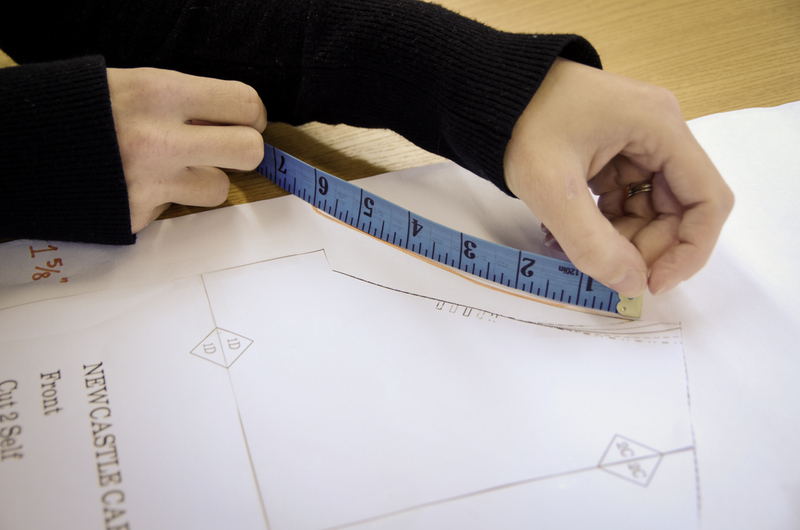 You’ll need rulers (a curved on is preferable but you can always eyeball the curves if you don’t have one! 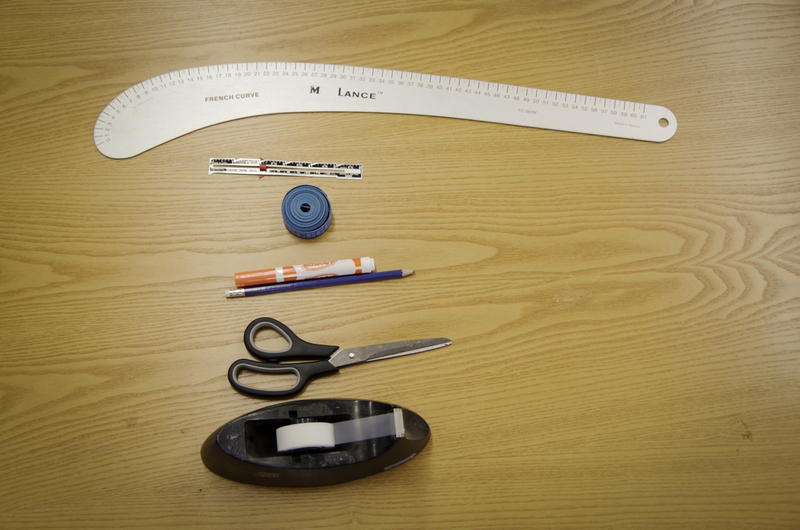 ), a pencil or marker, scissors and tape. These are the pieces that I eliminated for my sweater: The Back Neck Facing, the Front Facing, and the Button Placket. In the end, of course, all of this was irrelevant because I added buttons instead of a zipper after all and fudged things, trusting that the forgiving wool would hide that I was pulling and tugging things off grain by making the front overlap and button up asymmetrically! After adding width to the front of the cardigan I adjusted the neck curve so that it would extend to the new CF. I tried to keep the old neckline and the new neckline as close to the same measurement as possible but I ended up needing to add a little length to the collar pattern pieces so that they would still reach the centre front of the cardigan. To create the patch pockets, I cut rectangles of wool 7 1/2″ tall X 6 1/2″ wide and sewed them to the Cardigan Front pieces with exposed raw edges (I like how the edges felt and look fluffy when this wool is washed and dried). 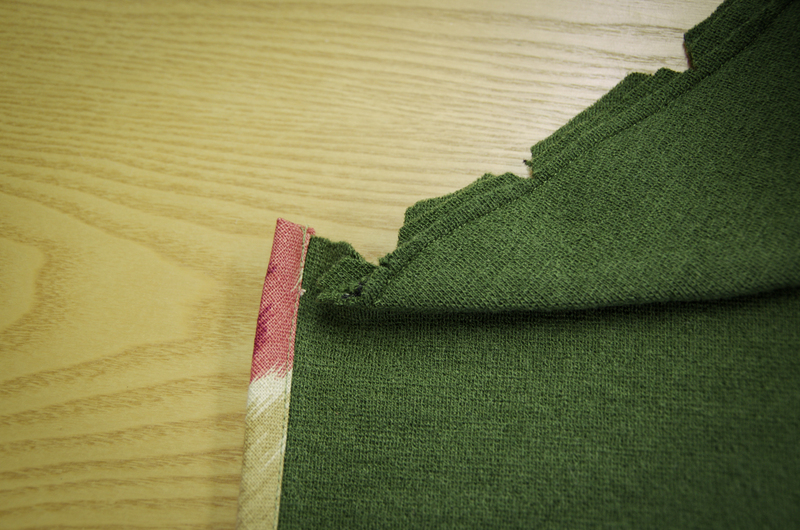 You could easily serge and turn under the edges if your fabric frays or you don’t like the look of the raw edges. Instead of sewing all the way up to the top of the pocket outside edge, I stopped half way up and then folded over the loose flap and tacked it down with a decorative button. This pocket, with the angled top opening is really comfortable to put my hands in! Before sewing the shoulder seams together, I top-stitched on strips of leather in the same way the Shoulder Yoke is sewn on. I also bound the CF because I was envisioning adding a zipper at a later point and wanted finished seam allowances. If I had known I was going to be turning under approx. 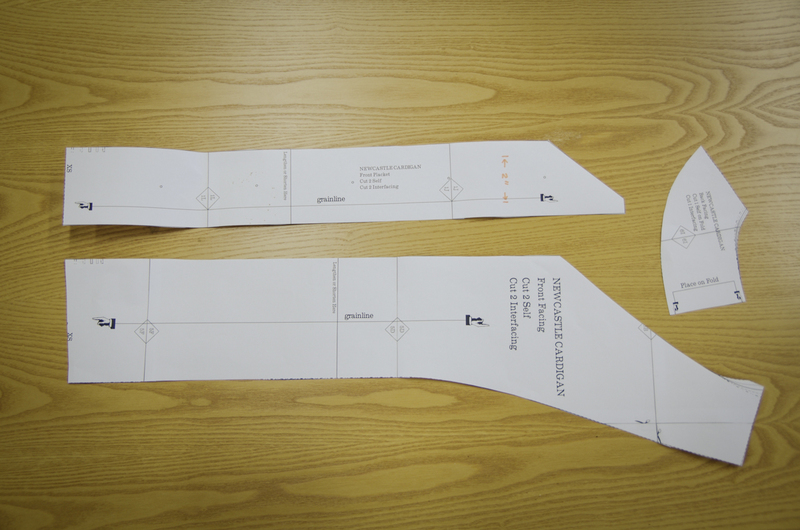 1 1/2″ as a self-facing I would have interfaced this strip before adding the binding. All the binding made for a very pretty garment, but really, in the end the sewing steps took just as long as using the facings would have and were much more fiddly (I guess it depends how comfortable your machine is with stitching woven binding onto thick and stretchy knit layers). Both the facing and binding/self facing methods have their advantages and disadvantages and I am glad to have tried both for the Newcastle because I often worry that people will be a little put off by the idea of a cardigan with facings. In the end, I like the facing method more as it creates a sturdier garment with less visible exterior stitching and less fighting with the tricky combination of woven and knit fabrics. Would you consider converting the Newcastle Cardigan pattern into a women’s version? Thanks for the fun photo shoot Matt! Categories: Friday Posts, Morgan's Sewing Projects, newcastle cardigan, Tutorials | Tags: no facing tutorial, pattern sale, selfish sewing | Permalink. 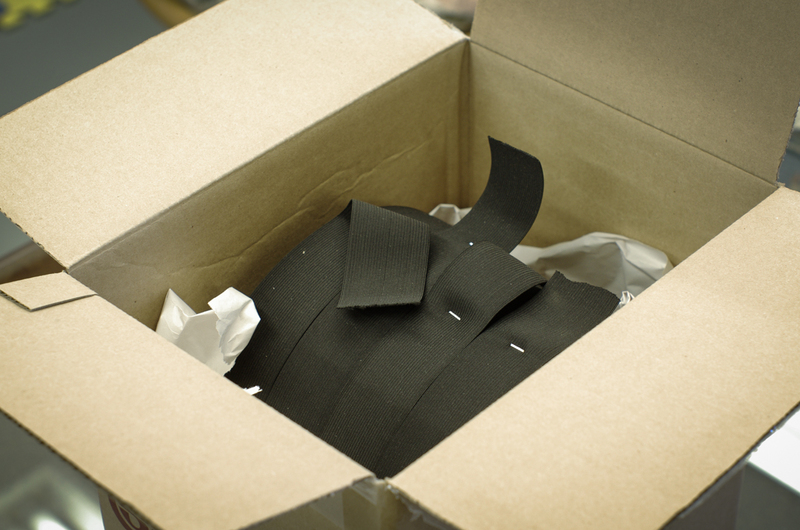 Any guesses what all of this black elastic could lead to? …thus my daydreaming has been completely filled by the idea of a Sew-cation of selfish sewing. Have you heard of the term ‘sew-cation‘ before? 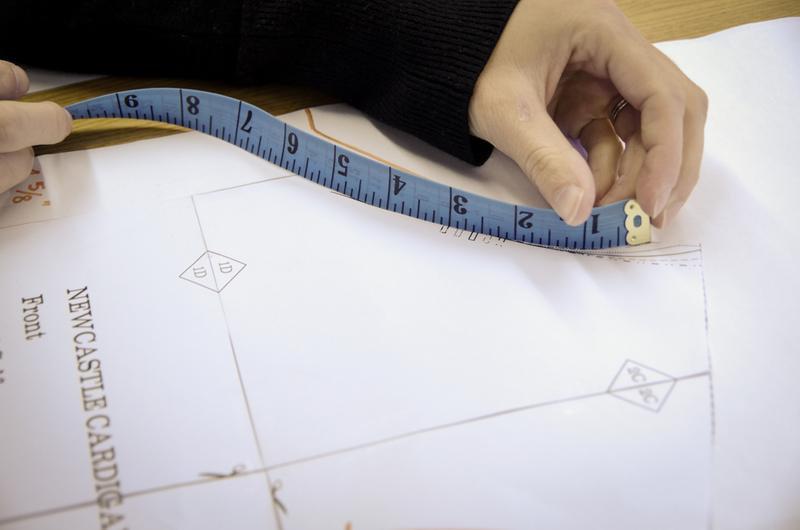 I’ve seen it crop up on all sorts of blogs and the concept of it is just too enticing to resist: a whole [insert time frame here] where the sewist pushes all other obligations and thoughts out of the way and immerses themselves into a world of sewing, sewing, sewing! I’m going to have mine starting Friday evening, September 20th and spend the weekend working on a few of the millions of selfish sewing projects that have been cramming themselves into my ever growing sewing wish list that sits in the back of my head. I’m going to watch sewing related movies, drink some wine, make a gourmet dinner or two with Matt and SEW! Do you like to watch movies or shows while you are sewing? I only tend to when I am sewing something for myself. If I am sewing Thread Theory samples or pillows and shams for my work with the Heather Company I usually only have music on so that I stay completely focused. But it will be a different story entirely during my sew-cation! What movies or shows can I add to my small list? I love watching Chocolat for inspiration – aside from the gorgeous outfits, I love the music in the film and the colour and feel of the filming. 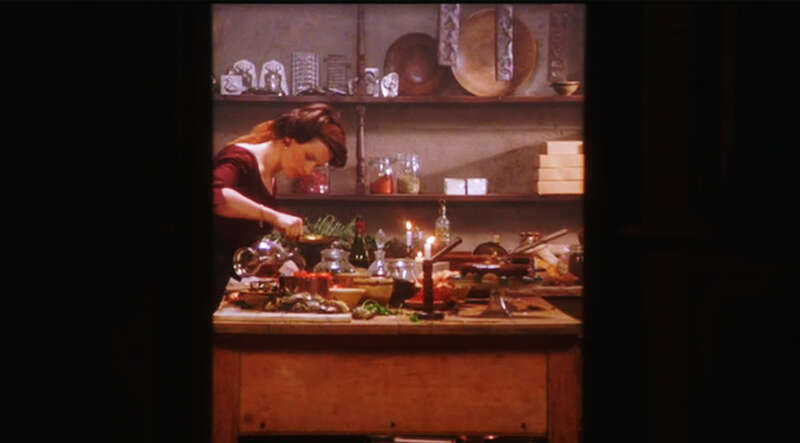 I find the cooking scene during which they are preparing for the birthday party makes me want to run to either a fabric store or the grocery store – I am suddenly inspired to sew with luscious chocolate brown silks and make Chicken Mole (yum!). I also love the documentary Bill Cunningham New York which my Textiles class watched last September. 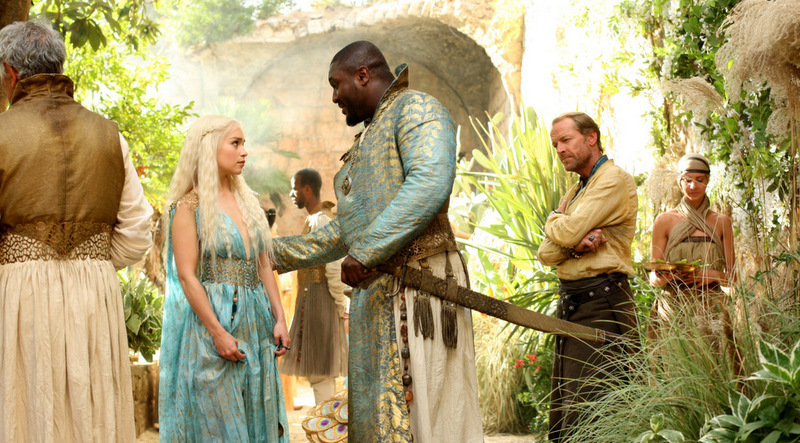 The costumes from the Game of Thrones series are amazing inspiration as well (of course). Have you ever had a sew-cation? What did you sew and how did you choose to relax? 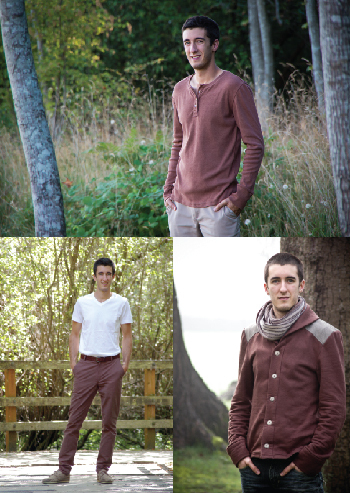 If you are eager to share your finished Jedediah Pants, Strathcona Henleys or Newcastle Cardigans – you are in luck! I’ve made Flickr groups for each pattern (click on each pattern’s name to view the group) so you can easily upload all your photos (in progress or finished) and browse through inspirational photos of other people’s projects before you embark on making your own version of a Thread Theory pattern. I am new to using Flickr so if you notice that I’ve set something up incorrectly of if I could make the groups easier to use and view, please let me know any suggestions you have! Categories: Friday Posts | Tags: flickr group, grainline studio, jorth, laurel, scout tee, sew-cation, Sewaholic | Permalink. Thank you, everyone, for all the enthusiasm and support over the last few weeks. 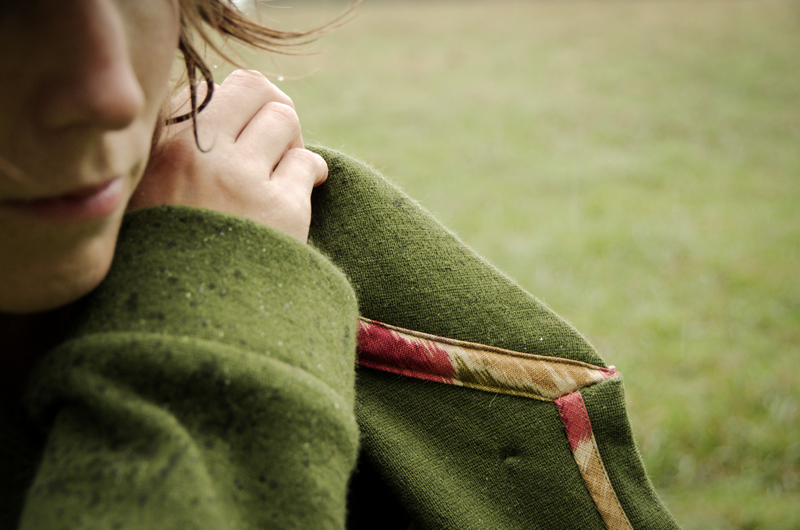 Now that we have three patterns launched and only the Goldstream Peacoat left to tackle in the Parkland Casual Menswear Collection (a BIG project! 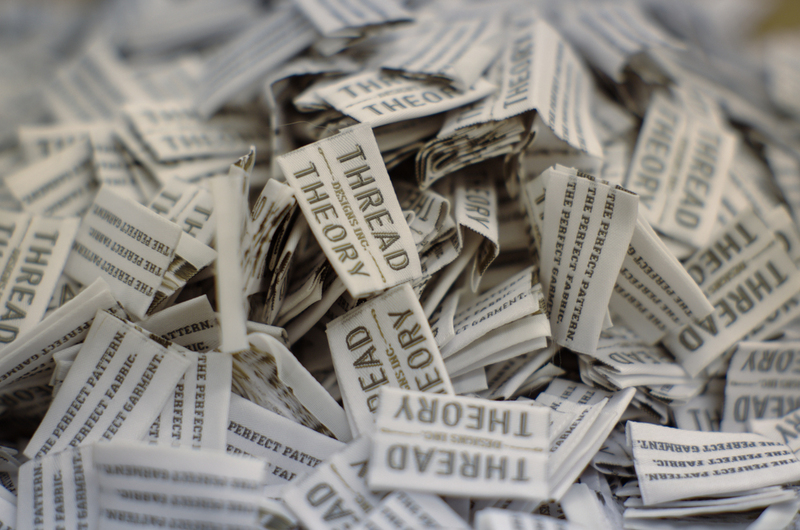 ), we are looking forward to our next collection and our many plans for Thread Theory. 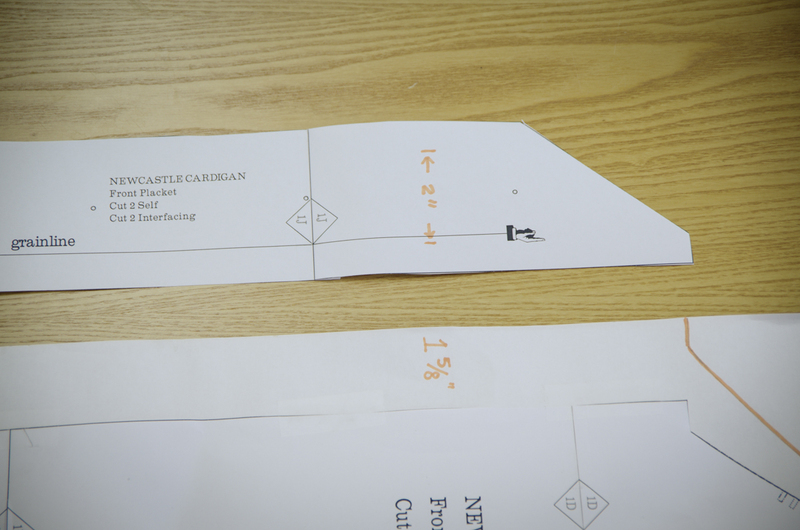 Here is a bit of an overview of where we are sitting with Thread Theory right now seeing as we have completed our first quarter of sales and are well into our second – the Newcastle Cardigan was launched May 15th. I can’t believe how much has been accomplished since then! We have been absolutely in awe of the Jedediah pants that have been popping up on Kollabora for the Jedediah Sew-Along contest – good luck to everyone who is entering! I am glad that the winner will be chosen based on public voting because I could never choose my favorite…I’ve been ‘hearting’ them all (head on over to ‘heart’ your favorite before September 16th!). And I guess that leads me to the next activity that we have been working on in the Thread Theory studio: we are currently in the process of putting our first three patterns into print! The process has gone very smoothly so far and we are so excited for the moment when we will have our gorgeously designed envelopes in our hands (expect a thorough photo shoot of the moment…this is something that has to be thoroughly recorded for the Thread Theory yearbook :P). We are working with Sonia Bishop, a talented graphic designer who just so happens to date Matt’s brother, Mike. It has been fun to keep it in the family – because of this, we even got to hold a ‘business meeting’ on the back of Mike’s sailboat as we dried off after a dip in the ocean, complete with sunshine and beers in hand! Now THAT is a reason I like owning my own business! Apart from the benefits of working with someone we enjoy hanging out with, Sonia has a ton of enthusiasm for the image we want to create with our packaging and I have no doubt that you will all love what she comes up with! We are also beginning to work with a very admirable printing company based out of Vancouver who operates so efficiently that they are officially carbon neutral. 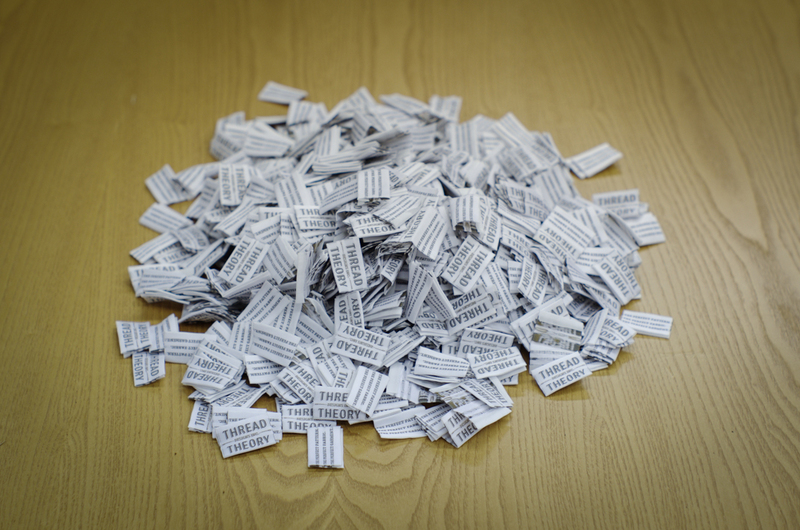 We love the range of recycled papers that they have to offer and their sales team has really taken the effort to understand what we are envisioning for the pattern packaging and have offered some really interesting options that I think will make the packaging really work for the sewer. I hope I am right in imagining that no one wants another crinkled and ripped envelope to add to their already chaotic pattern boxes or shelves – I think we have figured out a way to make our packaging super sturdy and easy to re-use so that our patterns will become staples to be used many times! In blogging news, I want to show off Maider’s really well sewn version of the Newcastle Cardigan. She made the cardigan for her boyfriend’s birthday and when he opened up his present, he thought that it was store bought! I can see why, she did a great job of finishing the insides and the wine coloured fabric that she chose works really nicely with the design. I like that she included the shoulder details but kept them in self fabric instead of using a contrast. This created a really subtle detail which was a perfect spot to highlight her VERY straight top-stitching! Look at that perfect top-stitching! Also, thank you to Laura of Behind the Hedgerow for including Thread Theory in her list of her “Top 10 Autumn Selfish Sewing Patterns”…even if menswear garments wouldn’t really be selfish sewing for her! We are flattered to be mentioned in her list of amazing pattern companies and I couldn’t agree more with her choice of Victory Pattern’s Roxanne pattern – I have been meaning to make up that pattern for ages because I LOVE that collar. 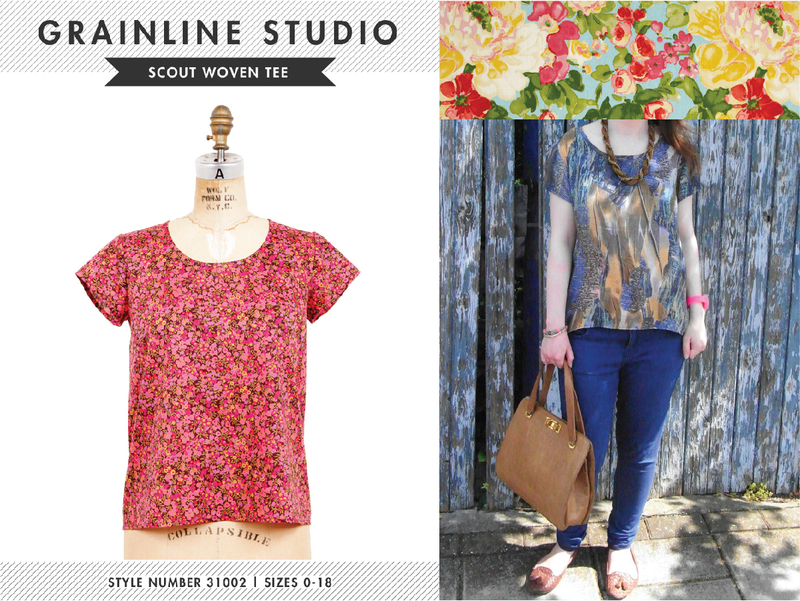 Sown Brooklyn’s version is pretty much the TOP item on my list of things that get me inspired to sew at the moment. Sown Brooklyn’s absolutely gorgeous version of Victory Pattern’s Roxanne. 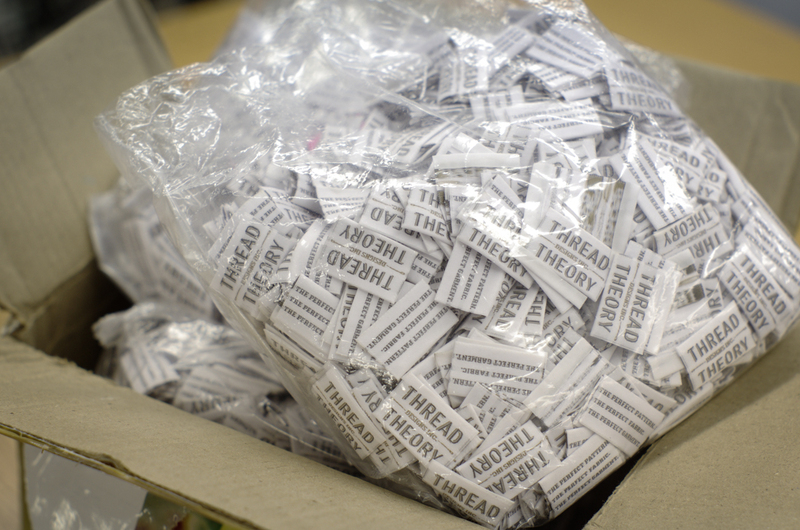 Are you curious about what goes on ‘behind the scenes’ at Thread Theory? I always love reading Tasia’s monthly reports over at Sewaholic patterns and probably wouldn’t have had the courage to start my own pattern company without her very matter of fact and wonderfully open reports on her own experience. I hope that we are fairly transparent over here in the menswear corner of the indie pattern company world and would love to answer any questions you ever have about us! Categories: Friday Posts, newcastle cardigan, Showcase | Tags: hemlock printing, kollabora, roxanne, sonia bishop, victory patterns | Permalink.